One thing to note... this is a deviation of our regular meeting time due to a scheduling conflict. We usually meet on the 4th Thursday of every month, however this time we'll meet on the 3rd Thursday. This scheduling change is effective for July only. We've also ~finally~ created a pseudo mailing list for JOG members! It is based off the RSS feed for the JOG Announcements list on the JOG website. When a new announcement is added, it will not only be on the RSS feed, but also sent to everyone who has an email subscription to the site (thanks to FeedBurner for this one). 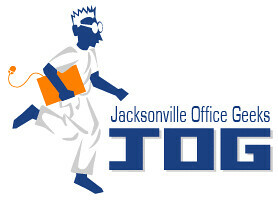 Use this link to submit your email address to subscribe to the JOG mailing list: Subscribe to JOG announcements.Alternatively, you can subscribe to the JOG announcements list with the FeedBurner URL: http://feeds.feedburner.com/JacksonvilleOfficeGeeks.